I was five years old the first day I set foot in a ballet studio; I never imagined that ballet would transform – and save – my life. For one thing, my studio wasn't really a studio, but a large open room in an irregularly shaped church that looked like a stained glass twisty spiral. You should also know that ballet was not my idea; it was my mother's, and I remember hiding in the closet, hoping she'd forget to bring me to class so I could stay home and play kickball with my brothers. Over time I grew to love ballet. 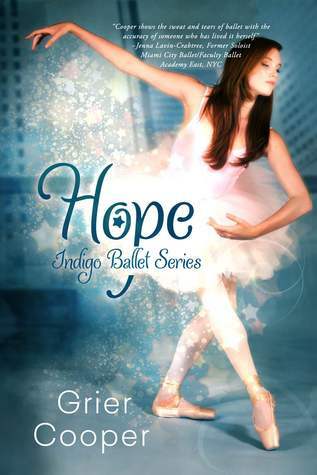 Just like Indigo (the main character of the Indigo Ballet Series), I appreciated the structure and predictability of ballet classes, but my favorite part was leaping across the floor, those few moments of freedom when I could defy gravity and fly. Ballet teaches you so many things: posture and placement, precision of movement, listening and memory skills, and how to live comfortably in your body. But my most important takeaways were what I like to call the 3 D's of dance: dedication, discipline, and determination. These are the things that help me the most as a writer because so much of writing is self-governed. Without discipline, it would be impossible to write a book in the first place. Without dedication and determination there's no forward momentum. I enjoy sharing what it's like to be a ballet dancer with readers. While many people are fascinated by the ballet world or yearn to be dancers themselves, not many get to experience that life firsthand. My dance career brought me many places, from New York to Israel, from San Francisco to Ecuador; it's fun to share the magic and misery that ballet life can be. Today I still dance and perform from time to time. The dance studio is like an old friend and sometimes feels more like home than anywhere else does. I believe we were born to move – why else would our bodies have so many moving parts? There are moments, when the music speaks to my heart and my body responds, where I forget about everything else except that moment, where the boundaries of who I am cease to exist....that's the beauty of dance. Those moments that make your heart beat quicker? That's inspiration. I am fascinated by ballet. It always seems to require the most dedicated young people. Most other things you can find in your old age, but dance is something I guess you have to have passion for since you were young. Me, I can't control my arms when I'm pointedly looking at them. Beautiful cover! Giselle & Grier - it's always a pleasure!